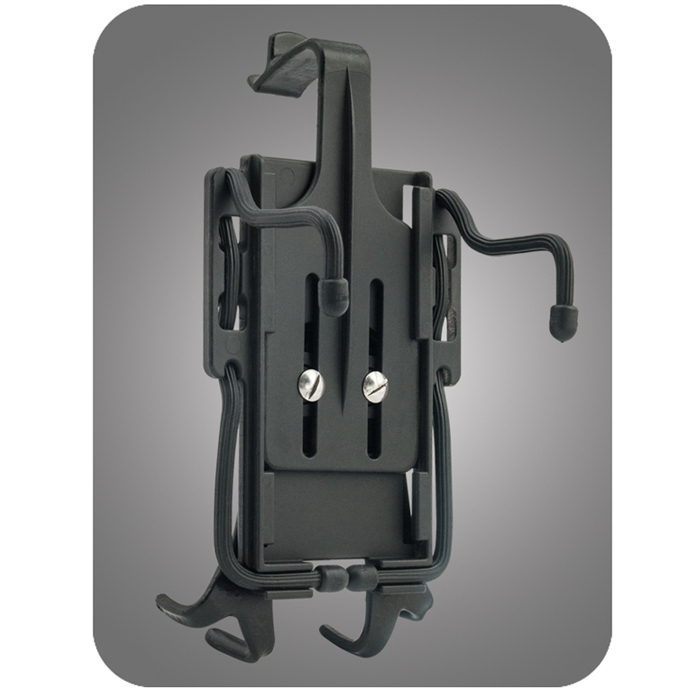 Device Compatibility: Depth range: .315" - .625" | Height range: 4.4" - 5.56" | Width range: 1.5" - 3.0"
The Connect Cradle Universal Mobile Device Holder is a versatile way to create multiple docking stations for your mobile device in your car, home, and office. With a few quick twists, you can adjust it to perfectly fit nearly any sized mobile device, including iPhones and Android phones. The top and bottom adjustable dipped rubber grips create both cushion and friction, so the Connect Cradle Universal snaps easily and securely around your device, even one thats already in its own case. The two durable, flexible Gear Ties on the cases top and bottom configure in a multitude of ways. Bend the top Gear Tie arms and insert them into the dashboard vent of your car, so you can view maps, follow your GPS, or activate Siri, without juggling or fumbling with the phone in the process. When youve reached your destination, the Connect Cradle Universal easily detaches from the car, and the bottom Gear Ties can be bent to create a new docking station on your desk, table, or countertop - basically any smooth flat surface.